Grandmaster gathered intelligence and experience from heavenly and the human life, experience successively thousands of hardships and pressures and finally completed the design of unique “special soul healing resort” which can save millions of human beings. Phase II “special soul healing resort” is on the basis of successfully verified Phase I through the first 10 year at the United States, further extensive and in-depth refining the mind, body and spirit energy and gradually entering the Enlightenment stable stage, this is a step by step method and at each step it can be verified and leading towards enlightenment program. And sowing the seeds of wisdom will inspire the upper root for insight in this life; lower-roots wisdom will grow rapidly; this is a personalized, long-term, and stable field to set up the soul growth effectiveness. A good analogy (imagine) this program is like a securing a first row seat on the fastest space shuttle to enlightenment. 1) Depend on the karma, the above mentioned courses may be adjusted. 2) Phase I and phase III may be added into the contents as well, as appropriate, will be determined. Qinway Healing Technology and Scientific Theory has been leading many successful healing cases in the previous 20 years, through many programs such as retreats and workshops, both in Beijing of China and America, the super scientific theory has also been verified as a great truth. 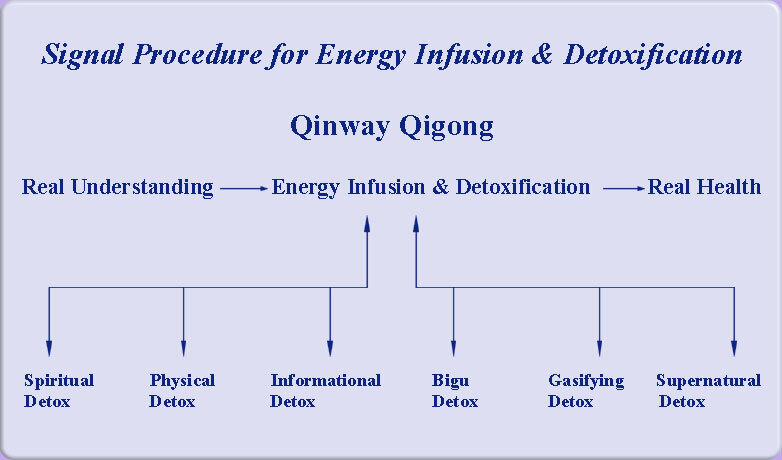 As shown in the chart below, the Qinway Qigong Technical Procedure starts from "Real Understanding", which has very much to do with "changing your mind". Followed by the process of "Energy Infusion & Detoxification". The key is an effective combination of both.